No spaces appear in TotalSpaces preferences under the layout tab, although text there indicates that I have 16 desktops. I had 9 before the update. 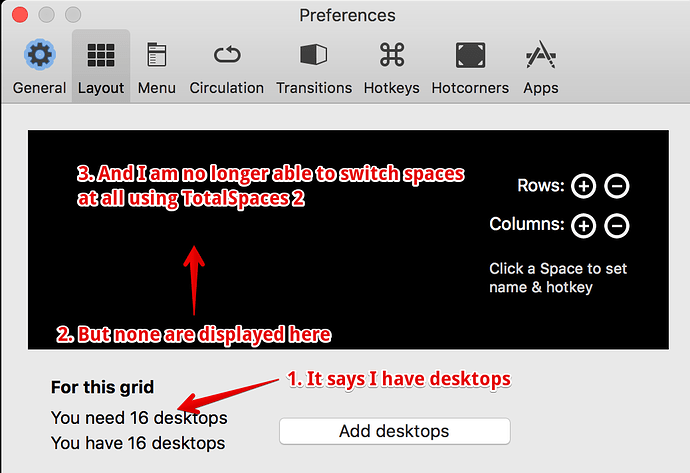 I can’t switch spaces using TotalSpaces at all. For example, I had mapped the view overview grid functionality to a mouse button. That no longer works, and neither does the assigned hotkey. All of this was working until precisely the moment of the update. So nothing else about the computer has changed. Can I please downgrade? Is that possible? I’ve come to rely on (and love!) TotalSpaces. If you revert to 2.7.7 your Spaces will miraculously reappear. Happened to me. I recommend you run the uninstaller before re-installing an older version (it won’t erase your settings). We have been investigating this issue, hope to have a resolution in the next version. Reinstalling previous version 2.7.7 doesn’t change the matter. I want to uninstall COMPLETELY and reinstall TS again. It seems uninstall script does not erase TS completely. Some additional files or preferences remain? I found that removing all desktops in MissionControl before installation of TS 2.7.10 solves the problem. All preferences are lost but TS works fine again. I made rows and columns sufficiently for my use and redefined target desktops for many Apps.